I decided this was a place I could take a stab at learning some silverlight UI. ok... So it's getting late and it's certainly not perfect, but here's where I am now. The only really tricky piece was... 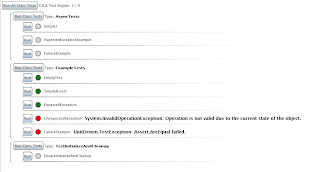 The original UI used nested ListBox controls which threw me down a path of thinking the program was broken... basically with a ListBox inside of a ListBox you have to select the first item, then the sub item, and in this application, only then, can you select the "Run" button to execute the unit test... I spent time looking through code trying to figure out if there was a bug in the testing contexts. I then had to wrap everything inside of a ScrollViewer because the ItemsControl doesn't create one automatically like the ListBox does. So I updated the main grid in the XAML, and shifted a few things around to allow this old feature to be seen in the new UI. after that was done, it was basically playing around with different styling elements to end up with the UI above. It was a good simple exploratoin into some of the Silverlight's WPF capabilities. Your work on this patch is trully appreciated. That listbox issue was trully annoying one. Thanks for the patch, I applied it today.